Select appropriate mathematics to solve a problem. Compare and evaluate different methods for solving a problem and make generalizations about the appropriateness of different approaches. 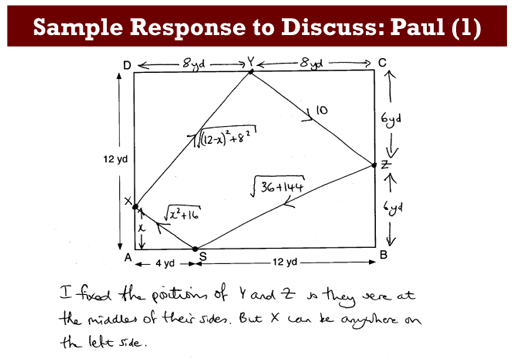 Understand the Pythagorean Theorem and how it can be used to solve problems in the real world. Before the lesson, students attempt The Schoolyard Problem individually. You review these initial attempts, formulating questions that will help students to improve their work. After a brief lesson introduction, students respond individually to the questions on their work. Then, in groups of 2 or 3, students compare their different approaches and examine and comment on some sample student responses. They identify features of these responses that may help them with their own work. In the same small groups, students now work together to produce a collaborative solution in the form of a poster. Each student will need a copy of the task The Schoolyard Problem. Provide calculators, rulers, and squared/graph paper for students who choose to use them. 20 minutes before the lesson, a 100-minute lesson (or split into two shorter lessons) and 10 minutes in a follow-up lesson (or for homework). Timings given are approximate. Exact timings will depend on the needs of your class.